Netherlands-based Mark Wagenbuur has just uploaded another fascinating video on his youtube channel, this time about child traffic training in the Netherlands. Little needs to be said, except that Mark states towards the end that there were 15 child traffic deaths last year in the Netherlands. This compares with 124 in the UK in 2008. The UK population is 61.4m, the Netherlands 16.5m. Do your maths. Then have a look a look at this video and think for a second about how it differs from the UK. The vast amount of energy, money and peoples’ focus on self-defence measures for cyclists in the UK appears to be diverting us from the real problems. The logic is simple and obvious – the greater the amount and speed of motorised traffic, the greater the need for safe and high-quality cycling infrastructure. David Hembrow explores this logic further with a recent post on his blog. But behind this policy lies a wider approach to urban planning. Residential streets are designed for residential use, and road planning ensures that rat-running, the scourge of many of Darlington’s streets, is simply not possible. A few examples of this have appeared in Darlington, notably on the Haughton cycle route on Brunswick Street. But this is the exception rather than the rule for residential streets. Developing a cycling culture in Britain requires town planners and politicians to consider urban development more holistically. Cycling cannot simply be bolted on to an existing plan. Rather it needs to be an integral, and contributory factor, in a wider vision for residential streets, urban mobility, and the place of motorised traffic in our living spaces. The opportunity is now there for Darlington, and other UK towns, to adopt just this approach, with Local Transport Plan 3, which will frame future transport thinking until 2025, now under consideration. But rather than being scared off by the excellent standards of infrastructure apparent in David and Mark’s videos, local authorities in the UK would do well to look again at the example of Bremen in our own film, Beauty and the Bike. In Bremen, levels of cycling are high (25%) despite very patchy standards of infrastructure. Here, cycle paths were first installed in the 1970’s, at a time when traffic levels – and infrastructure build standards – were generally much lower than today. But behind the development of cycling infrastructure even then was a policy of urban planning that recognised where and how motorised traffic should be organised. The infrastructure pictured here also includes a ramp across every side street that slows down turning traffic, and gives priority to cyclists on the cycle path. Moreover, these side streets all have 20mph speed limits, are typically one way for motorised traffic but two way for cyclists, and lead to nowhere for through traffic. The double concerns of everyday cyclists in the UK – poor infrastructure and motorist behaviour – mirror perfectly the wider perspective that has lain behind core urban transport policy in this country. Thankfully, a debate is now opening up that questions this. As this post is being written, Lynn Sloman is speaking in Darlington on the findings of a report commissioned by the Department for Transport to independently quantify the results obtained by the three Sustainable Travel Demonstration Towns; Darlington, Peterborough and Worcester. 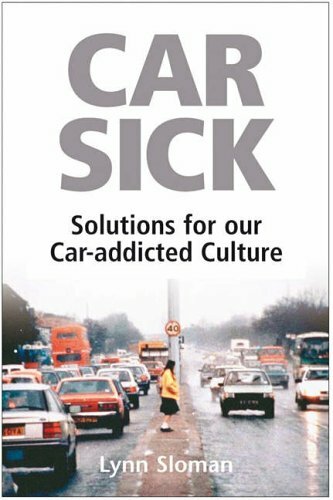 Her excellent book Car Sick offers a way forward for de-motorising our urban centres. Cycling Campaign members are there to meet her. LTP3s around the country really have to decide – is cycling going to continue as a bolt on to car-centric urban transport policy? Or is it time for the UK to begin the long process of de-motorising our towns? We are a voluntary organisation. Our phone may be on silent when our volunteer is at his/her day job. Sending an email is usually quicker.